My proud unification blessed families and members from around the world, I am grateful to see you. We welcomed the new spring for 2013. True Parents was fond of the season spring. It is a season full of dreams. All things revives and shows their beauty and promises the harvest of the fruition of the future. Ladies and gentlemen! What is your dream? 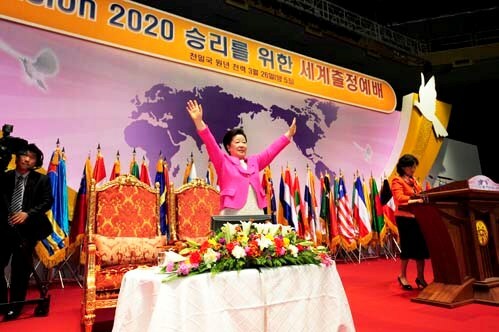 I ask the blessed children of the unification church to inherit the tradition of True Parents with absolute faith, fulfill the mission as Clan Messiah, expand your responsibility from clan to the society, nation and to the world, and do your best to create all the people into people of Cheon Il Guk which has been yearned by heavenly parents and True Parents for a very long time. This is the path for you who stand in front of your descendants as ancestors without any embarrassment.